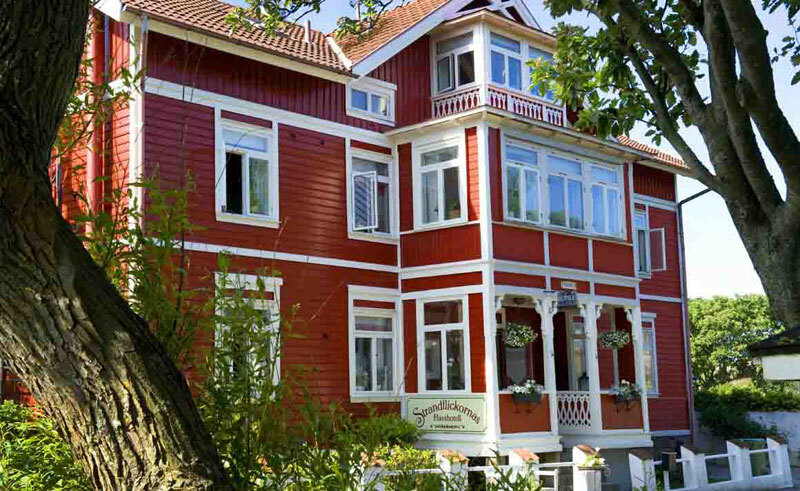 Situated by the sea in a tranquil yet central part of town, the 21-room Lysekil Havshotel is a beautiful villa, the original building built at the beginning of the last century. With traditional Swedish touches and a unique decor, the hotel remains reminiscent of a bygone era. Many of the rooms (all with private bathroom) have been decorated and furnished with antiques and personal touches, retaining the villa’s old world charm. Choose from the elegant reserve of the Captain’s room, the lacy charm of the Maid’s room, or smell the spices in the Turkish Consul’s bedroom. The majority of the rooms have a lovely view to compliment the traditional decoration. Complimentary coffee, biscuits and fruit are available at any time in the lovely breakfast room, and meals are available to order in the evening. Tennis courts are next to the hotel, and the pink-tinged rocks that edge Lysekil’s shores or its beach are the perfect spot for sunbathing or a swim. For those looking for something a little more active, Lysekil and the surrounding area offers plenty to do. Try deep-sea fishing, scuba diving or even a round of golf. Rent a boat, go on a seal safari and watch the wildlife or even enjoy the array of shops in the area.